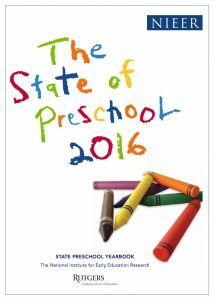 Student enrollment in state-funded preschool programs has reached an all-time high, according to the 2016 State of Preschool Yearbook published by the National Institute for Early Education Research (NIEER). However, access to high-quality programs still varies significantly from state to state. Supported by the Heising-Simons Foundation’s Education program, NIEER’s annual yearbook is the only national report of its kind to provide detailed information on student enrollment, teacher qualifications, and policies related to quality––such as the presence of a qualified teacher and assistant, small class size, and low teacher-to-student ratio. State-funded preschool program enrollment reached an all-time high, serving nearly 1.5 million children, 32 percent of 4-year-olds and 5 percent of 3-year-olds. The District of Columbia, Florida, Oklahoma, and Wisconsin had highest enrollment among 4-year-olds, all serving more than 70 percent. State funding for preschool rose 8 percent to about $7.4 billion, a $550 million increase driven mostly by additional spending in California and Texas. Federal Preschool Development Grants helped 18 states make strides in funding, enrollment, and quality. Just four states require teachers of dual language learners to have specific qualifications to educate this population. NIEER has been tracking state preschool policies and programs annually since 2002, providing vital information at the national and state-by-state levels to policymakers and researchers. Please read the full Yearbook here, and listen to NPR Morning Edition’s short audio story about the report.